As a busy mom I fix other people's hair (& lunches, homework, problems, dinner, schedules, and more) daily. And it's rare I take the time to have someone else pamper me. I still have a spa/massage gift certificate from my birthday in March that I haven't taken a break to use yet! 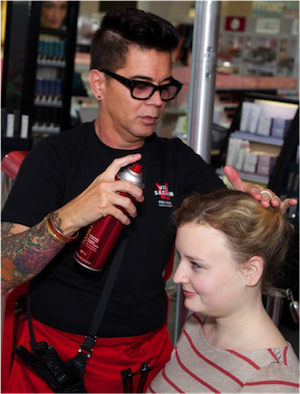 This morning I'm going to relax at a VIP preview party for the Chicago Vidal Sassoon Pop Up Salon at the Walgreens flagship store for a *complimentary dry-style* with Vidal Sassoon Pro Series expert David Reposar, who was trained by the master himself. Know that feeling when you leave the salon with your hair all done? It's an instant pick-me-up, right? Chances are you don't have the time to primp and fuss daily to create the perfect 'do, but salon-happy hair shouldn't have to be a once every two-to-six month thing. Enter Vidal Sassoon and his revolutionary approach to hair styling. Sassoon made salon-ready hair accessible and attainable for every woman and we're helping to celebrate his styling genius with a special event just for you. Learn just how Vidal Sassoon products can take your hair from bed head to an art form. Get styled with today's latest accessories with style expert Kevin Aeh and walk away with a fabulous Pro Series goodie bag and hairstyle must-haves. How do you feel when you look salon fabulous, and what does that empower you to go do? Follow the hashtag #VSCh on Twitter for real time updates from the event and share with us.